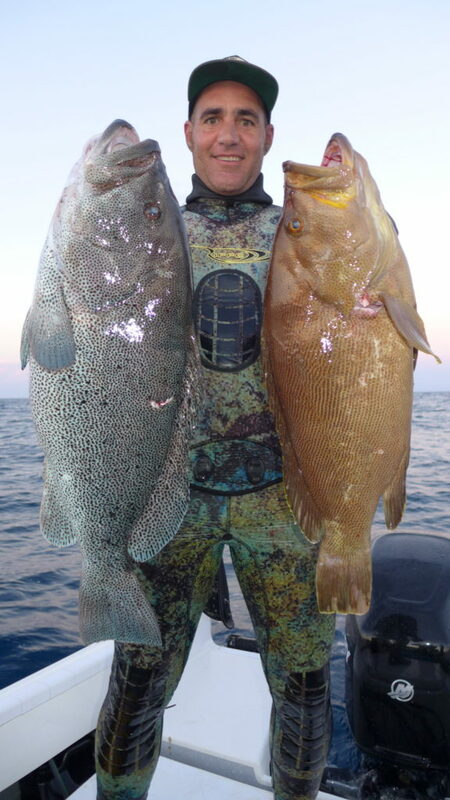 I met an incredible spearfishing couple while in Tonga; Jessie Cribs and Michael Takash. Both very experienced divers, it was easy working in the water together. We saw schools of Dogtooth Tunas, had personal best dives, Micheal rode a whale shark on his birthday, and we all landed nice fish. 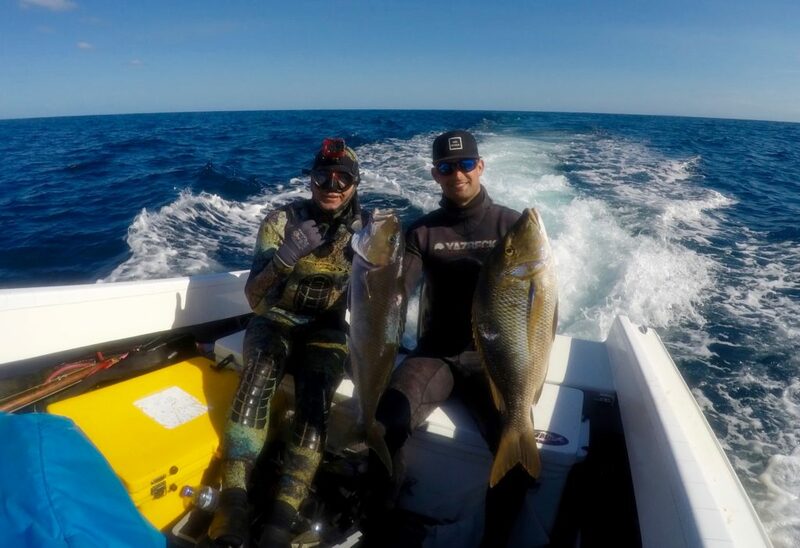 In short, we got along very well in a divers paradise, so much so, they referred me to their very talented spearfishing friend, Tim McDonald. 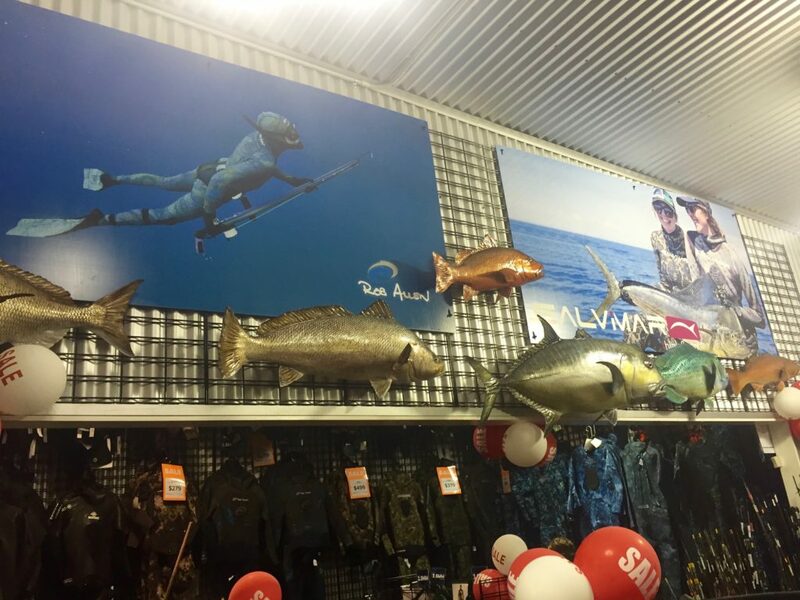 On the same day that I speared my Mulloway in Coffs Harbor I filleted my fish, packed my gear, and traveled nine hours to Brisbane where I would go on another spearfishing trip the very next day with Tim, his father, and Cliff Harvey. Tim picked me up at the bus station, and we slept for two short hours before leaving at midnight. Honestly, I had no clue where we were headed with my new spearfishing friend. 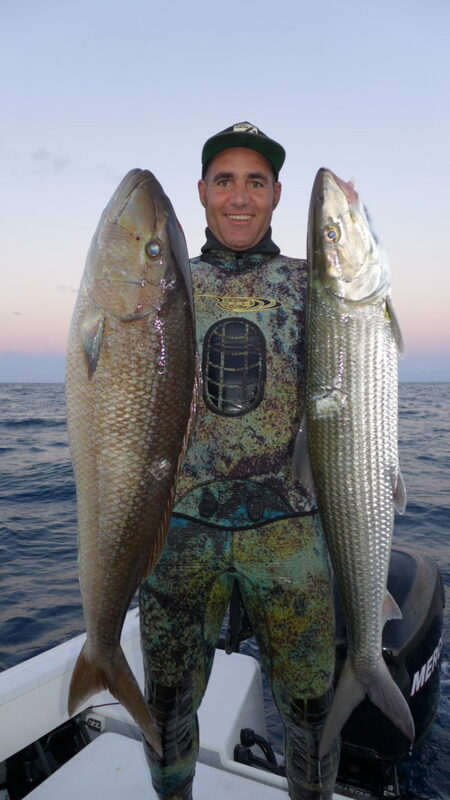 I would soon find out, but to protect Tim’s spearfishing grounds, I won’t say where we traveled. He has a small group of people he dives with and his spots are very valuable to him. Tim launched the boat and were welcomed by calm seas as we ran very far and fast in a classic yellow 19ft Haines Hunter boat named “The Goldfish.” Once we arrived at the first dive spot, we put our wetsuits on and hopped in. Unfortunately, the dirty water followed me from New Zealand and Coffs Harbor, Tim told me that this was the dirtiest he had ever experienced there. The murky water wasn’t going to stop us and we made the most of the situation. We worked the shallow spots first before moving to the deeper reefs, building up our breath. The day progressed with not much action in the morning but it continually got better. At the deep spots in 140ft we were looking for the prized Red Emperor, number one fish on my hit list. Dropping together with a safety at the surface, I watched Tim land a monster Green Jobfish (also known as a “Jobbie” or “Uku”). Dropping through the green water was very eerie but doing it together made it more comforting. There was a second Jobfish that I pursued but I ran out of breath cutting my dive at 116ft. The dirty water made it hard to drop on the sweet spot. We saw plenty of baitfish, had a Black Marlin breach right next to the boat, but no Red Emperors were spotted. We dove hard, bouncing from spot to spot easing our way back home until hit the Jobbie spot that was bursting with life. Swarmed by the largest Surgeon fish I have ever seen, they followed us down to the reefy bottom were the Mangrove Jacks and Jobfish live. I hunted Jobfish in Tonga the past two years and never thought I would see more of them anywhere in the world but here we were seeing schools of 30-40 large fish! 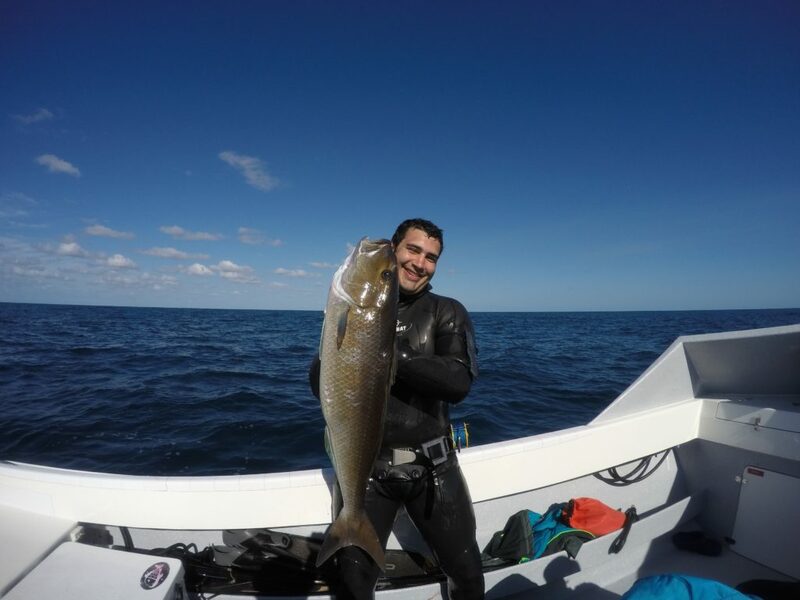 Tim shined by putting on one of the most impressive spearfishing display I have ever seen. It seemed like every deep drop he would come up with a big fish, his father at the helm of the Goldfish would come over and pick it up. 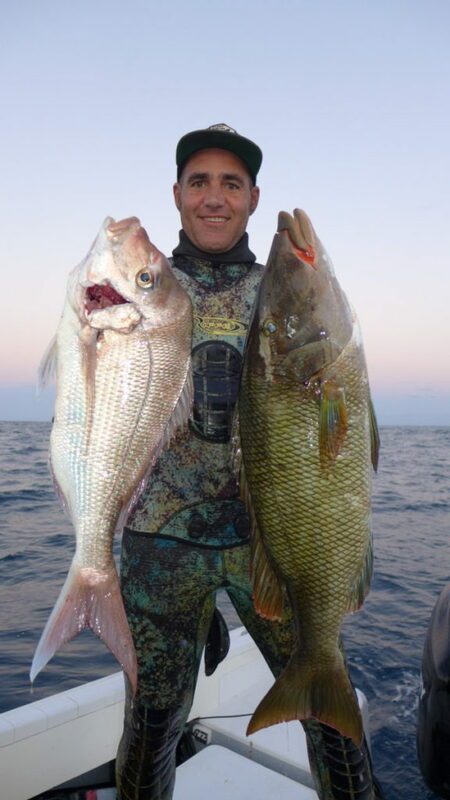 Jobfish are one of the most difficult fish that I have hunted. They are fast, skittish, and fight like crazy. That day Tim would land five Jobbies, three over the 10kg (22 pounds) mark including a two on one shot. Just ridiculous! On one dive I saw an odd Jobbie. Typically they are silver, green, or turquoise but this one was black and yellow with a deformed white hump on his head that looked like a crown. He is a know resident of this spot, and has been sighted every time Tim goes there. Tim named him “Granddad.” I followed this fish but pretend to have no interest in him until an even bigger Jobfish swam right up to me. I line up and take a “sure shot” but some how I miss! Between Tonga and Coffs all of my spears had been bent by Dogtooth Tunas, Kingfish, or my big Mulloway, I’d my best to bend them back but not good enough. The video shows a sharp downward angle as my spear leaves the speargun, missing the fish low. If any spearo tells you they don’t miss, they are a liar. Frustrated I missed a golden opportunity, I kept diving. Luckily I stumbled across the main school of Jobbies, but the reef was so fishy a large school of Surgeons blocked any shot. Looking to the left the surgeons just keep coming, so I looked down and saw my clear shot. Careful not to miss this time I got very close and pulled the trigger. You can see from the video it was a long way up, on this dive I actually experienced my first squeeze from the pressure in 93ft, this made the rest of the day a challenge to dive, especially deep. I could feel it when I took a full breath and coughing produced bright red blood in my spit, not a promising sign. I took a break, while Tim and Clifford kept flipping fish in the box. 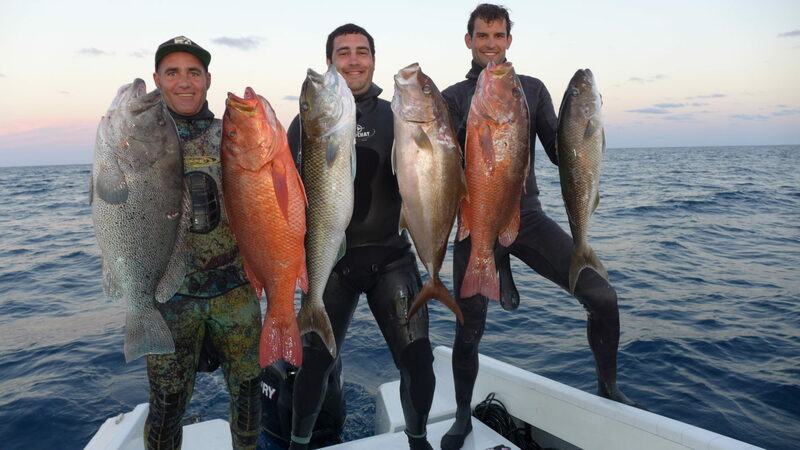 As the sun got closer to the water the fishing got better and Tim started landing a wide variety of fish, all of them large including: a Purple Cod, an African Pompano, Longnosed Emperor, Bonefish, and Snapper. It was tough but I made myself stay in the boat until the “shallower” spots that were in 85ft of water. The freediving manual probably says I should have stayed out but there are only so many times you get to dive remote locations in a different country. The first dive was not comfortable but I took my time to get a good breath for another try. I dropped and landed on top of a school of silver fish that scattered along the white sand. I followed the school deeper as they swam to the reef. I lined up on what I hoped was a Mangrove Jack and shot. There was a much bigger fish behind him but I had learned my lesson about chasing the big fish over the “sure shot” a few days earlier while hunting Kingfish in Coffs Harbor. Also with my bent spears I wanted close shot. I hit the fish square, he takes off startling a large turtle. The turtle and I exchange looks as we kicked in opposite directions. The fish hung me up on a rock, out of breath I would have to wait there for Tim and Cliff to be picked up so they could watch me dive and retrieve my fish. I was not sure if it was a Spangled Emperor or not, I had already landed one earlier that day and had been teased by Tim about my “doormat fish.” The Spangled Emperor has white meat but if over cooked it is the equivalent of chewing on a doormat. I really hoped that I was not waisting the last hour of daylight on an over sized Grunt. With a fresh breath I followed my black line through the murky water to find my fish and spear stuck on a rock. 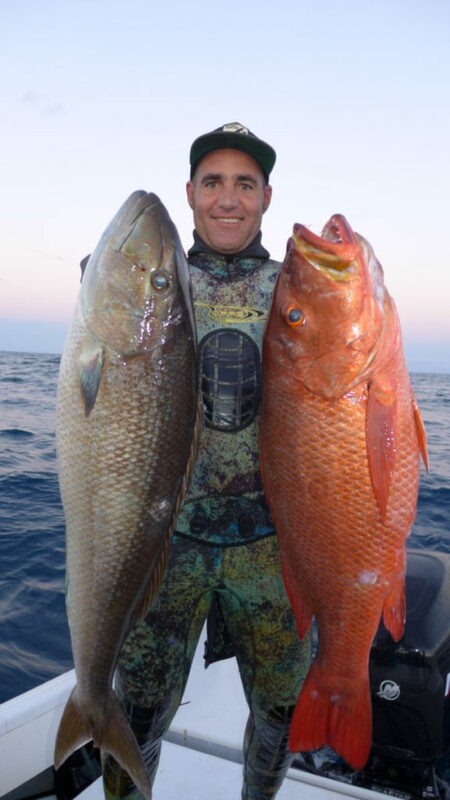 Luckily it was the right species, I freed my spear and from the surface they pulled up my Mangrove Jack. 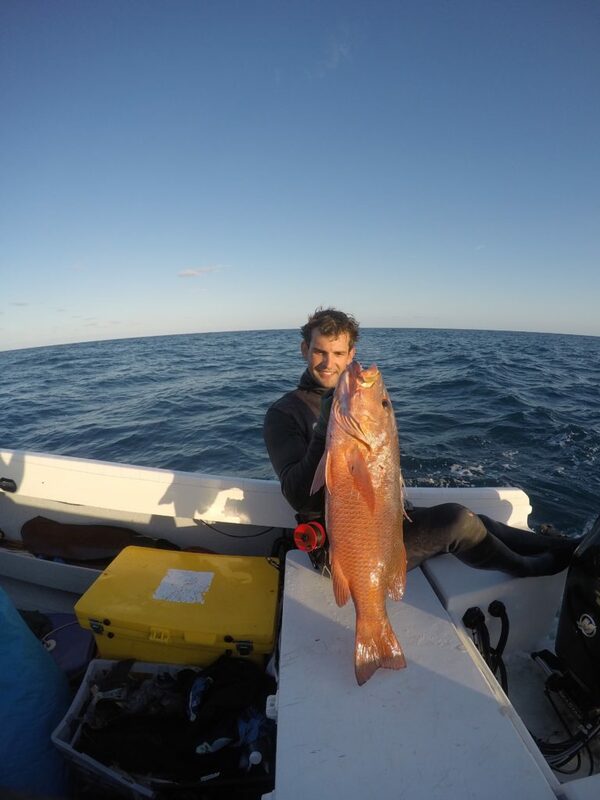 The beautiful orange fish weighed 8kg (17.8 pounds), a very large Mangrove Jack by Australia’s standards! We started our trek home during the twilight hours, running near the closest piece of land. Tim navigated the breaking swell with ease, I could see why they called this stretch “The Gold Coast.” The giant sand dunes were glowing a brilliant gold color, a similar color as our Mangrove Jacks. This moment didn’t feel like reality. We enjoyed the last bit of light eating the bananas, snacks, and sandwiches we brought. It was still a long three hour run back though the night and the weather got progressively worse. It was pitch black, white knuckle ride home in on the 19ft boat. I have a tremendous amount of respect for Tim and his ability to grind through a 26hr day on 2 hours of sleep. This probably was just another dive day for him, but he showed me what Australia has to offer and I’ll remember that day for the rest of my life. I can’t thank you enough mate! 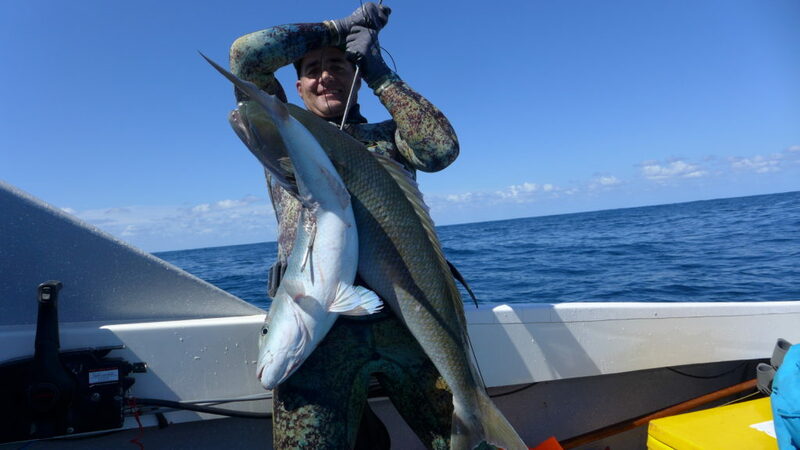 Stay tuned for ‘Australia – Part 3’ I headed to Townsville for two overnight spearfishing trips at the Great Barrier Reef during the Super Moon! Cliff with his PB Jobbie!